WhiteCloud Software Ltd. announced the release of version 4.8 of EAComposer. An innovative and easy-to-use enterprise architecture tool. Use it to manage your IT landscape and technology portfolio. Delivered as a pure SaaS product: cloud hosted with a subscription based license model. This released delivered a series of UI improvements to enhance the overall user experience. 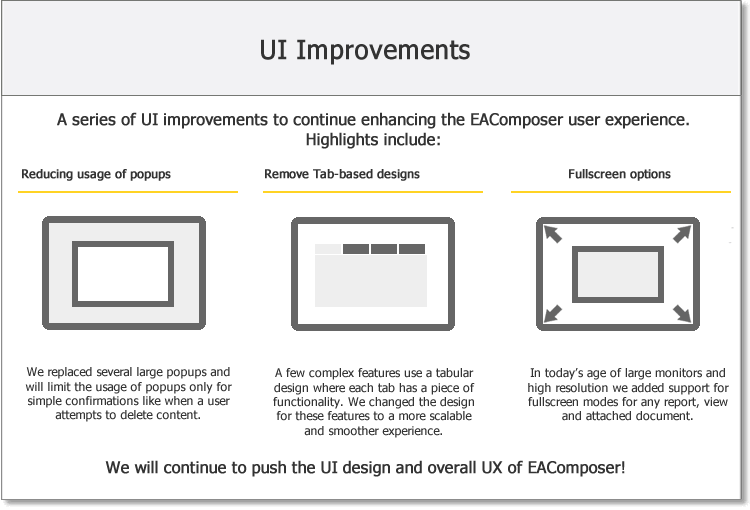 - Reduce popups: There were a few places within EAComposer where complex popups were being used (popups are the mini windows that sit on top of the main browser window). These complex popups were replaced with a modern, smooth slide in/out panels. - Remove usage of tab designs: A few features sections were using tabs and each tab has some functionality (and the user moves from tab to tab). We removed the usage of tabs and instead use a smooth scrolling list style design. - Maximize to Fullscreen: View reports and diagrams in a fullscreen mode with the click a maximize button. The report or view will simply expand to a fullscreen view. - Expand usage of Document Viewer: We also added this same fullscreen ability to our online document viewer. The document viewer is now a standard component and used inside: Templates & Artifacts, Compliance Assessments, Decision Log, Standards Library and the Reference Library. Above are the highlights, dozens of other visual design improvements where implemented to create a cleaner, simpler, smoother User Interface (UI) and User Experience (UX).